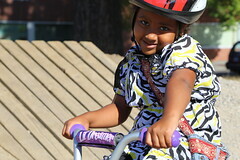 Residents of New Columbia and staff from the Community Cycling Center and Home Forward celebrated the grand opening of the new Bike Skills Park with a bike safety fair last week. The new park, located adjacent to the Bike Repair Hub on the corner of N. Trenton Street and N. Woolsey Avenue, offers a safe riding and skill development area for neighbors of all ages. Over 100 residents – mostly children – showed up to the park to celebrate. At the event, we provided healthy snacks and set up a series of stations for kids to learn how to fix a flat tire, earn a helmet, and create safety rules for the new park. The Bike Repair Hub remained open during the entire duration of the event, as members of We All Can Ride and Community Cycling Center staff and volunteers completed a myriad of repairs, ranging from seat adjustments to truing wheels. The dream began in 2011, when Zan Gibbs, our former Adult Programs Manager, worked on the grant with input from residents. “New Columbia expressed a strong desire to provide a safe place for people to ride. The younger kids in particular did not have a safe space because there are a lot of cars in New Columbia.” Zan, now the Resident and Community Services Coordinator for Home Forward at New Columbia, participated in last week’s celebration, and finally saw the dream become a reality. The Skills Park course includes beginning and advanced areas for people of all skill levels. 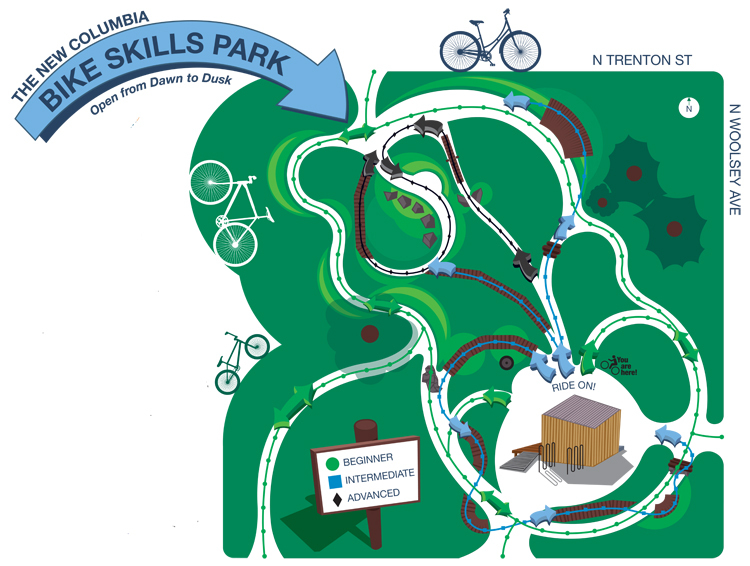 The outside beginner’s loop offers fun obstacles, like log rolls and a rock garden, giving people experience with uneven grade. The interior of the track contains tighter turns and narrower board rides, boulder pinch points, advanced berms, and a teeter-totter obstacle for those that want to work on more advanced skill sets. 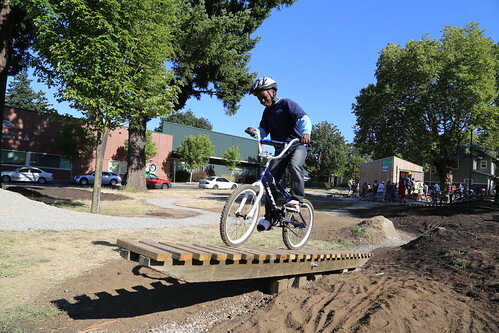 We All Can Ride invites the Portland community to ride on the new Bike Skills Park at the upcoming North Portland Sunday Parkways on July 28th. Look for it on the N. Dwight Avenue and N. Trenton Street turn. The pictures say it all – residents are thrilled with the new Skills Park.